Purchase the ad-free PDF crochet pattern for the Sierra Beanie here on Ravelry. Get the free crochet pattern for the Sierra Beanie by scrolling down! My first hat of the year! It’s August, so it’s basically Fall, right?! I know some may want summer to slow down, but I’m all about Fall! This beanie is part of the Christmas Hat Crochet Along that my blogger friends Katie (Salty Pearl Crochet) and Heather (The Unraveled Mitten) are hosting! 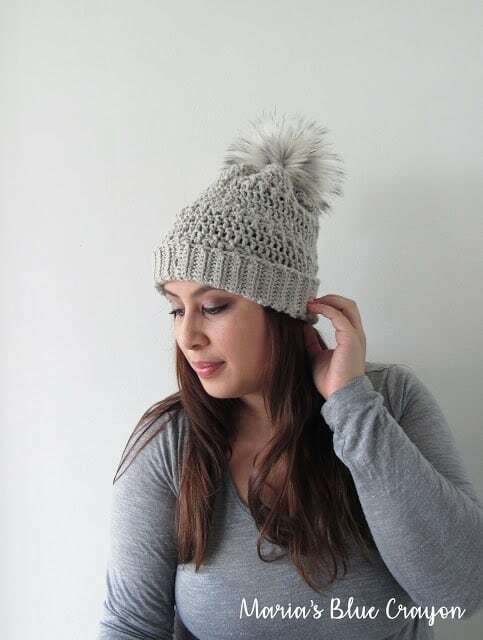 It’s a crochet along that includes 9 hat patterns from different designers – all hat patterns perfect for gift giving! I have so many great things to say about this beanie! First of all, you can wear it TWO ways! You can wear it as a slouchy or fold up the brim for a less slouchy look. Also, I love the pom pom addition! You can make a yarn pom pom but I love the look of a big poofy faux fur pom pom. Another great aspect? 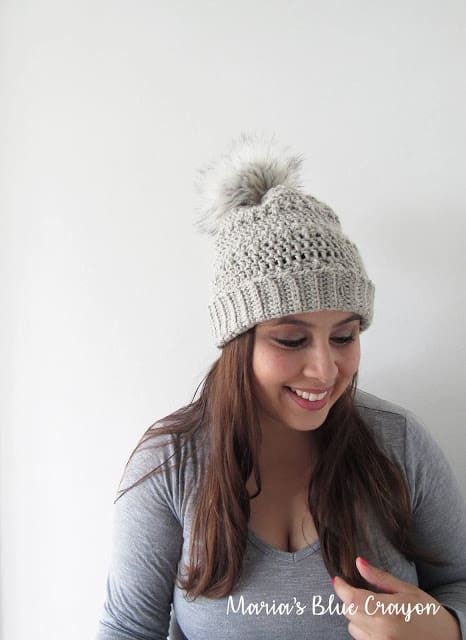 This beanie is so adorable and perfect for gift giving! 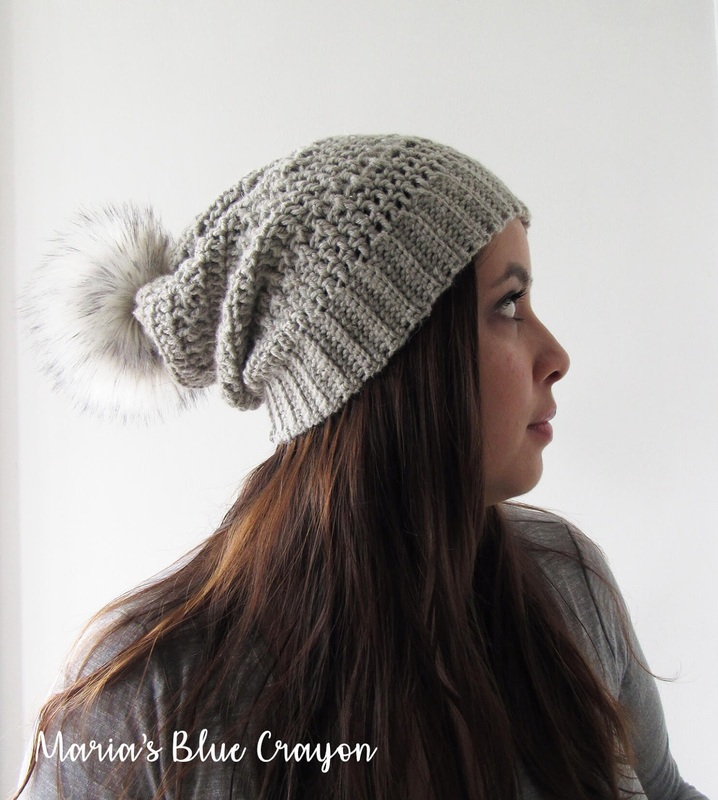 Who wouldn’t want a pretty textured crochet beanie to keep them warm? Make it in neutrals to go with practically any outfit/winter coat or use a color for a great pop of color to add to an outfit! I used Yarn Bee’s Rustic Romantic and the subtle flecks worked so well with the texture of this hat! It is a worsted weight yarn, and you may substitute any other worsted weight yarn. I would caution against I Love This Yarn! and Red Heart Super Saver, as those seem to be a ‘thicker’ worsted weight and can make your hat too large. However, I’m not the boss of your crochet and you can use what ever you’d like! Not ready to make this crochet beanie yet? The beanie will be worked from the brim up. Fits adult head ~21”. Beanie can be worn two ways – slouchy or with brim folded up for a less slouchy look. Size adjustments: The brim should be 1-2” smaller than head circumference. Make the beanie smaller or larger by decreasing/increasing the number of rows for the brim. Make sure rows for the brim is an even number. Ch 1 and slip stitch the last and first rows together to form brim. Repeat Rounds 4-8 three more times. Fasten off, leave long tail. Weave in and out of the top stitches, pull tight and secure. Weave in ends and attach pom pom. Per your email, what blanket pattern are you referring to?